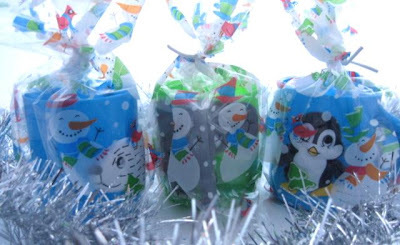 Funky Dory Party Bags Blog: Looking for Christmas Party Bags? Looking for Christmas Party Bags? Try these filled Christmas party mugs instead. They make brilliant Christmas party favours and gifts, and come in a variety of designs. You choose the type of mug you need, we will fill it with a festive-coloured balloon plus either a hair accessory or your choice of toys. It is all wrapped up in a Happy Snowman cello bag, all ready to give out to your guests. Choose from the unisex filled mug, the filled Christmas mug for girls, and the filled penguin party mug!